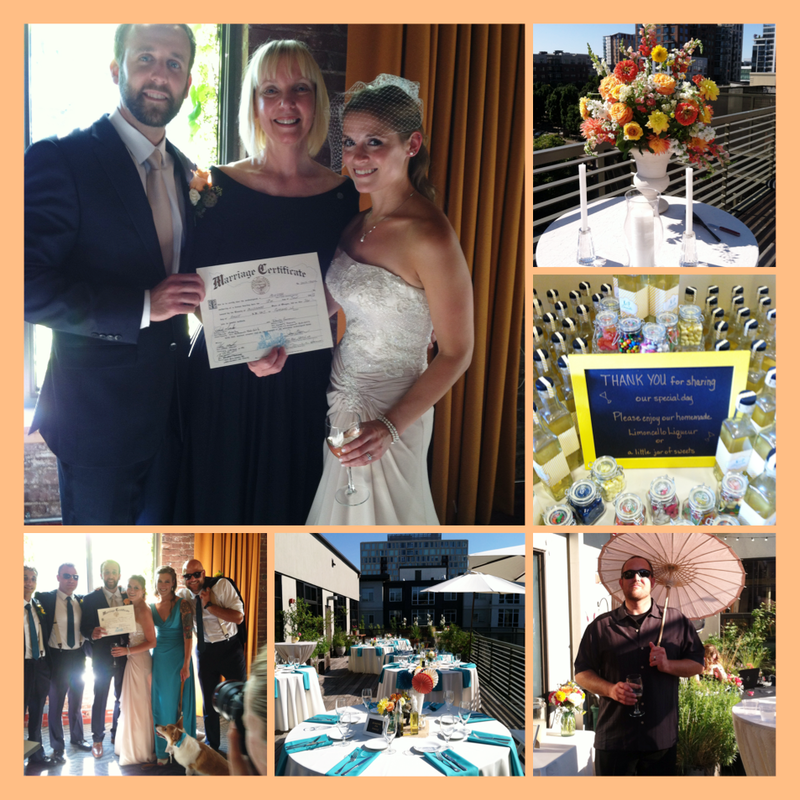 Parasols, hand fans and iced lemonade greeted guests as they stepped onto the rooftop terrace for Saturday’s wedding. Kim and Patrick chose the historic Pearl District Ecotrust building as the site for their evening celebration and a decor of turquoise, yellow and peach. The ceremony featured rose petals tossed with panache by two of the groomsmen and an aisle walk by “ring bearer” Samson, the couple’s two-year old Corgi. Guests flew in from Wisconsin, Texas and California for the big day and loved the uniqueness of the venue. Not to mention the delicious menu prepared by sustainable catering masters, Artemis, which included crab cake appetizers, wild caught salmon and white gulf prawn skewers. As a special thank you, guests were gifted with a bottle of Limoncello Liqueur homemade by the bride’s family. After a tropical honeymoon, the newlyweds return to their jobs and home in SW PDX. Congratulations, Kim and Patrick … may you always find a way to make sweet stories out of any lemons that life rolls your way.